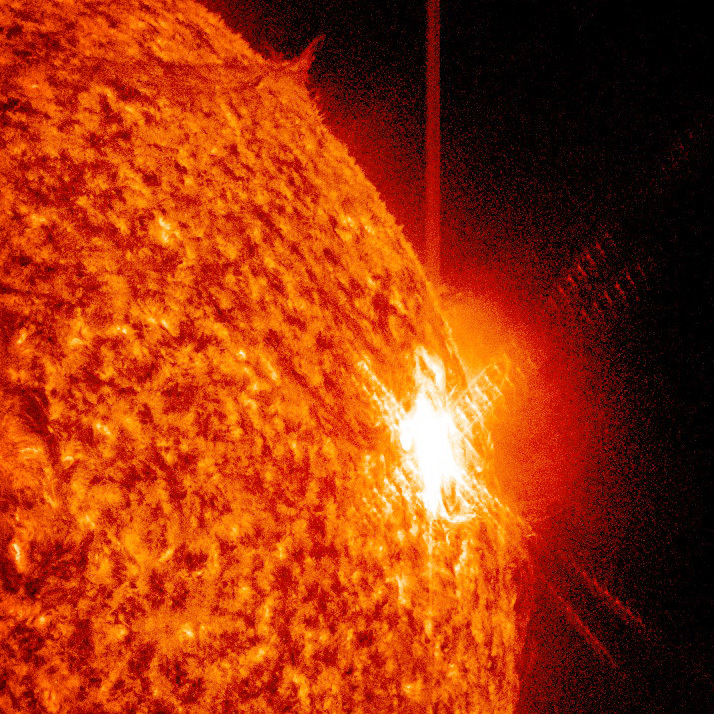 An X6.9 flare on the Sun's eastern limb on August 9, 2011. 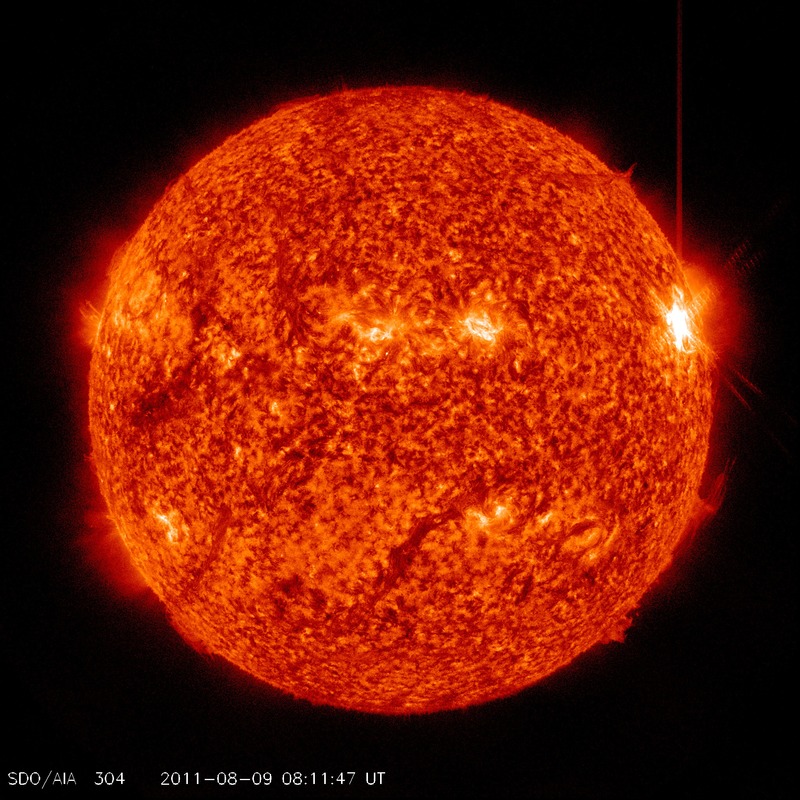 At 8:11 a.m. UT (3:11 am EDT) this morning the Sun unleashed a huge solar flare. Rated an X6.9, it was the most powerful flare of the current solar cycle… so strong, in fact, that some high-frequency radio blackouts were experienced here on Earth shortly after. It was three times stronger than the X2.2 February 15 flare. The image above shows the region where the flare took place, along the Sun’s eastern limb just north of its equator. The capture is from NASA’s Solar Dynamics Observatory’s AIA 304 imaging assembly. The biggest flares are known as “X-class flares” based on a classification system that divides solar flares according to their strength. The smallest ones are A-class (near background levels), followed by B, C, M and X. Similar to the Richter scale for earthquakes, each letter represents a 10-fold increase in energy output. So an X is ten times an M and 100 times a C. Within each letter class there is a finer scale from 1 to 9. The biggest X-class flares are by far the largest explosions in the solar system and are awesome to watch. Loops tens of times the size of Earth leap up off the sun’s surface when the sun’s magnetic fields cross over each other and reconnect. In the biggest events, this reconnection process can produce as much energy as a billion hydrogen bombs. If they’re directed at Earth, such flares and associated CMEs can create long lasting radiation storms that can harm satellites, communications systems, and even ground-based technologies and power grids. X-class flares on December 5 and December 6, 2006, for example, triggered a CME that interfered with GPS signals being sent to ground-based receivers. The current solar cycle will reach its peak in 2013, meaning flares like this – or stronger! – may become more and more common. It’s important for scientists to monitor the Sun’s activity so we know what to expect here on Earth for magnetic storms, since they can affect communications and sensitive electronics in orbit and on the ground. Although this event won’t have any direct effect on life on Earth, it may disturb some radio transmissions and create strong auroras in the next few days. Read more about this on Universe Today. Image courtesy of NASA/SDO and the AIA, EVE, and HMI science teams. Edited by J. Major. Next Post On The Rim Of Endeavour!